BishopBlog: What is driving Theresa May? I'm not one of those people who thinks all politicians are corrupt and evil. Undoubtedly such cases exist, and psychopaths often thrive in the kind of highly competitive context of politics, where you need a thick skin and a determination to succeed. But many people go into politics with the aim of making a positive difference, and I am open-minded enough to recognise that many of them are well-intentioned, even if I disagree with their political strategies and prejudices. I suspect Theresa May started out aiming to do good, but something has clearly gone horribly wrong, and I am intrigued as to what is motivating her. Many people have argued that what drives her is a lust for power. I have a different take on it. To me she looks very like a victim of 'mind control'. I got fascinated with this topic when writing a novel where some characters are recruited into a cult. Among my background reading was a book by Steve Hassan, Combating Cult Mind Control. Steve used his experience of being recruited into the Moonies as a student to cast light on the mental state that adherents get into. Although I've been tempted at times to think Theresa May has been abducted and had a chip put into her brain by a malign foreign power, I doubt that anyone is acting as her controller. But I do think that she has boxed herself in to a mental set from which she cannot escape. After she became Prime Minister, something changed radically in her behaviour. She had previously often espoused views I found odious, but she was not particularly weird. Indeed, prior to the Brexit vote in 2016, she gave a speech that was remarkably well-argued: (video version here). No doubt much was written by civil servants, but she sounded coherent and engaged. Over the months following Brexit, she became increasingly wooden, and rapidly earned the name 'Maybot', for her failure to engage with questions and to simply regurgitate the same old hackneyed cliches. Now anyone in her position would have difficulty: having supported Remain, and made very cogent arguments against leaving the EU, she now had to see the UK through a Brexit that was won by a narrow margin. We know she is a religious woman, who thinks that she is guided by God, and so I assume she prayed a fair bit and came to the conclusion that seeing through the democratically expressed will of the people was the one goal she would cling to. I am prepared to give her credit for thinking that was the right thing to do, rather than this being an opportunistic means of retaining power, as it is sometimes portrayed. It's worth bearing in mind that, as Steve Hassan noted, one thing the Moonies did with their converts would be to keep them awake with activities and surrounded by fellow believers. It's difficult to think rationally when sleep-deprived, when there is never any escape from the situation or down-time when you can talk things through with people who take a different view. May's schedule has been unremitting, with trips all over the world and relentless political pressure; it must have been utterly exhausting. So the way it looks to me is that she has brainwashed herself into a state of monomania as a way of coping with the situation. If you are going to do something very challenging, one way of dealing with it is simply to refuse to engage with any attempt to sway you from your course. The only thing that matters to May is achieving Brexit, regardless of how many livelihoods and institutions are destroyed in the process. Unpleasant truths are ignored or characterised as invalid. As PM of a country that she presumably cares about, May should be disturbed to hear that Brexit is proving disastrous for the car manufacturing industry, the banking sector, higher education, science and the National Health Service, and is likely to destroy the union with Northern Ireland and with Scotland. Her ability to avoid processing this information is reminiscent of Steve Hassan's account of his thought processes while in the Moonies, where he totally rejected his parents when they tried to reason with him, refusing to question any aspect of his beliefs and regarding them as evil. One piece of information that would make her implode is that the 'will of the people' might have changed. 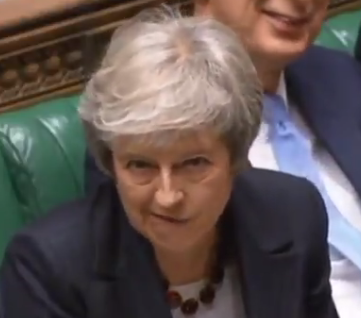 Her face contorted when Caroline Lucas raised this possibility in Parliament in November 2018 - almost as if the Maybot had reached a state of 'does not compute'. She is reduced to arguing that demands for another vote are 'anti-democratic', and characterising those who want this as her enemies: a very odd state of affairs, given that it is the same 'people' who would be expressing their more up-to-date and informed view. Meanwhile neither she nor anyone else has come up with a single advantage of Brexit for this country. I am on record of being opposed to another referendum – because I think a referendum is a terrible way of making political decisions on complex matters. But now it does seem the only option that might have some prospect of saving us from May's destructive course. Her mantra that we must obey the 'will of the people' could only be countered by a demonstration that the will of the people has indeed changed. Hundreds of thousands marching through London hasn't done it – they are just dismissed as the metropolitan elite. Five million signing a petition to revoke Article 50 hasn't done it, because it falls short of 17.4 million who voted for Brexit – even though the parallel petition to Leave without a Deal has only one tenth of the support. Polls are deemed inconclusive. So it seems the only way to demonstrate that the majority no longer wants the Brexit that is on offer would be another vote. Would she abandon Brexit if the people now voted against it? I wonder. It's difficult to change course when you have committed yourself to accepting that the UK must go through with Brexit even if it means breaking up the United Kingdom, and damaging jobs, the economy and our international standing. She may have started out concerned that to reject Brexit would be the act of a despot. Sadly, now in refusing to listen to the possibility that people may have changed their minds, she has turned into exactly that. I remember commenting somewhere when Theresa May was making some, to a Canadian, rather strange move a month or more ago, that given the amount of stress she has been under for so long, that she may no longer be able to function rationally. Enough strain and, probably, sleep deprivation impairs cognitive ability. Brainwashing oneself into monomania sounds like a good explanation for her behaviour. I just had not thought of it as something similar to the Moonies.